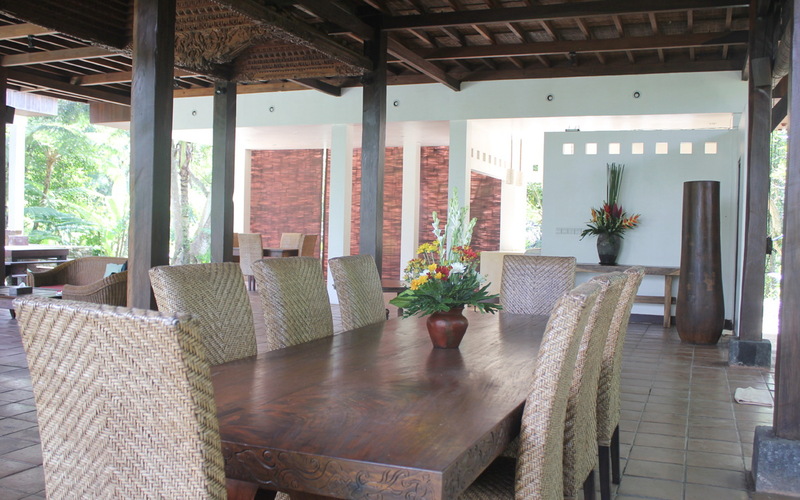 From $ 986AUD per night We have direct contracts with most villa owners. We don't add any booking fees. We are 100% transparent with no nasty surprises. 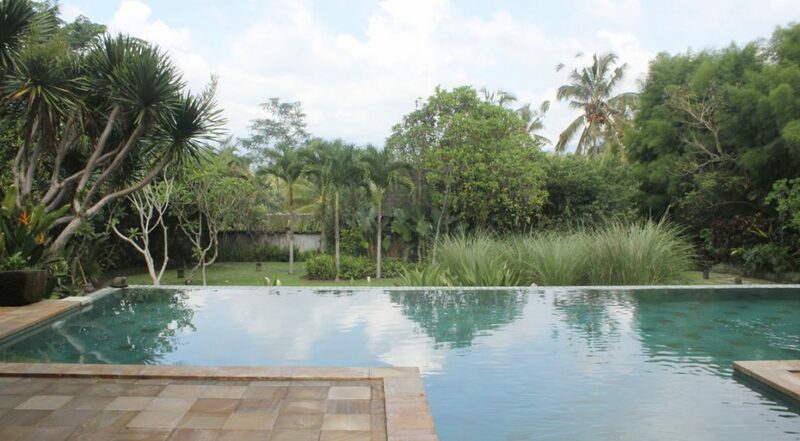 Close to Ubud central - rent this today! 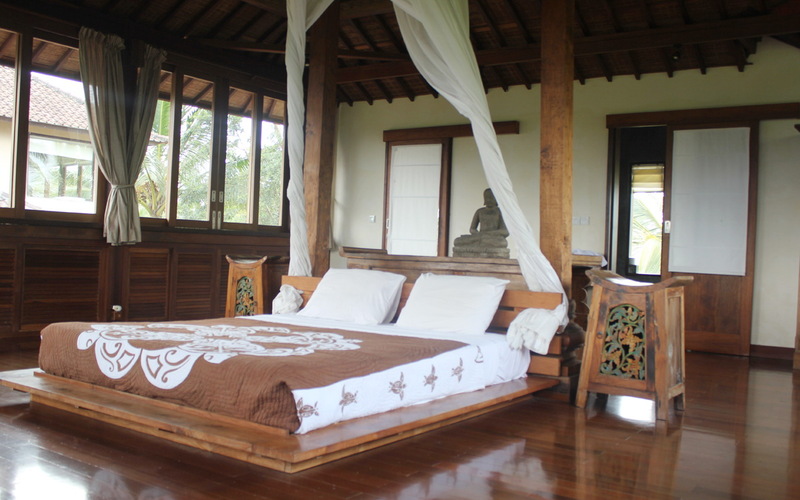 If you’re looking for a wonderful 7 bedroom Ubud villa holiday villa rental in the Ubud then Villa Atas Awan is perfect. 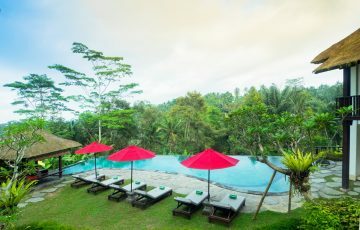 Located 20 minutes from the Ubud city centre, guests will have the chance to enjoy the true splendor of the lush rice terrace surrounds and views of the majestic Mt Agung in the background. 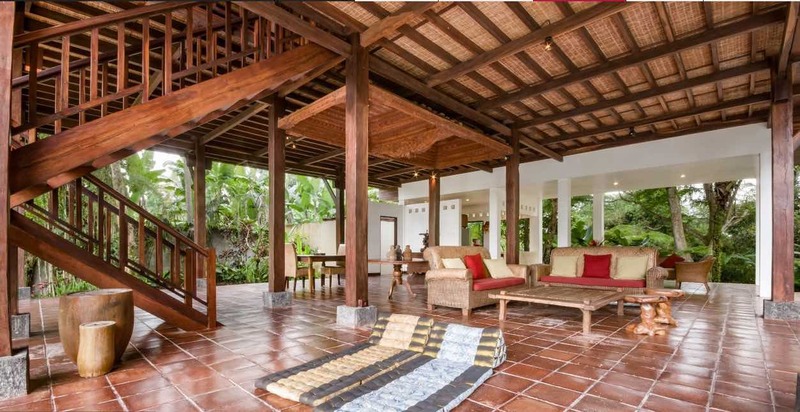 This villa is ideal for a group of families or a group seeking a wonderful, laid back and authentic Balinese location for their next holiday in Ubud where you are far away from the crowds, yet still within easy driving distance of Ubud. 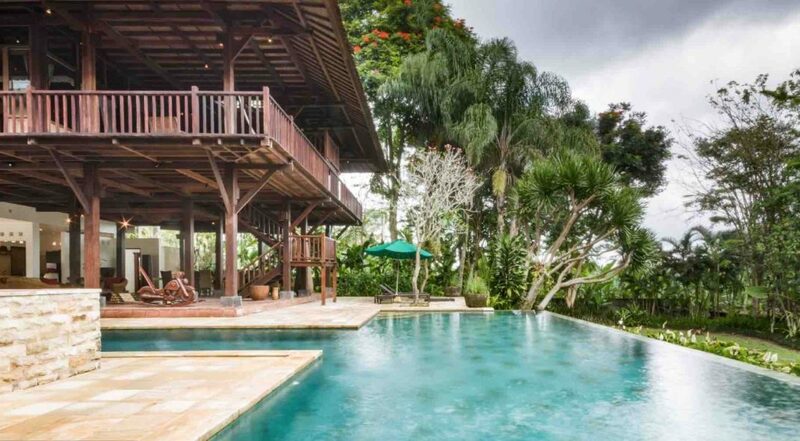 A fantastic swimming pool separates two double storey living and accommodation pavilions and comes to a head where it sweeps along the front of the pavilions and you can lean its infinity edge and gaze into the lush tropical surrounds. 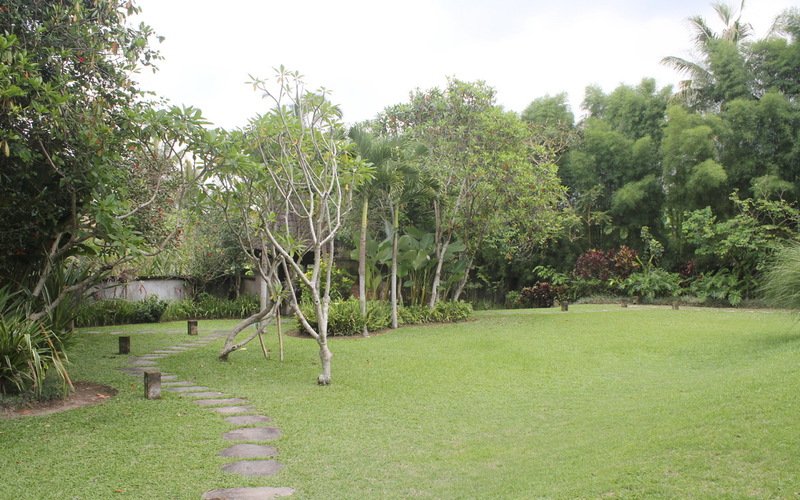 The sprawling grounds are full of mature trees, tropical plants, manicured lawns for lots of privacy & relaxation. 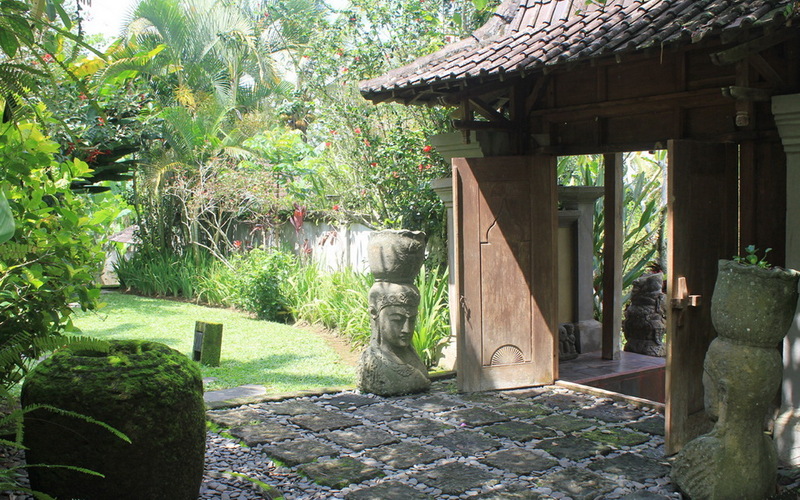 There are also calming koi ponds with water features and statues to add to the whole zen ambiance. 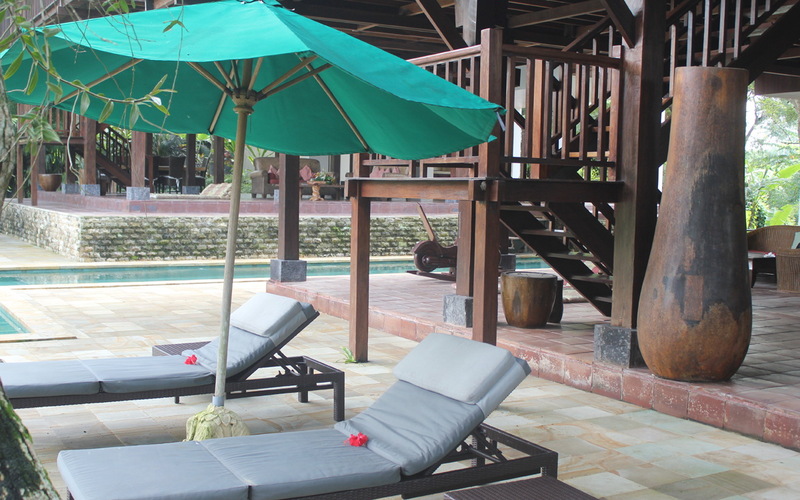 There are plenty of day beds and sun lounges so you can stretch out and enjoy the tropical sun. 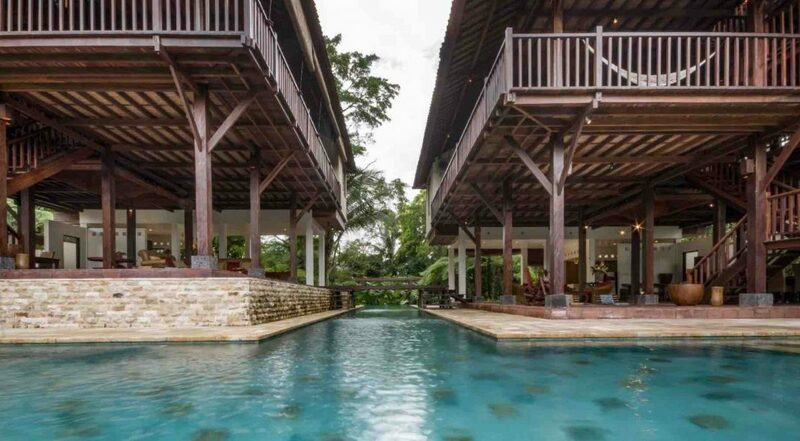 Beneath the two pavilions on the ground floor by the pool are two expansive open-air living areas. 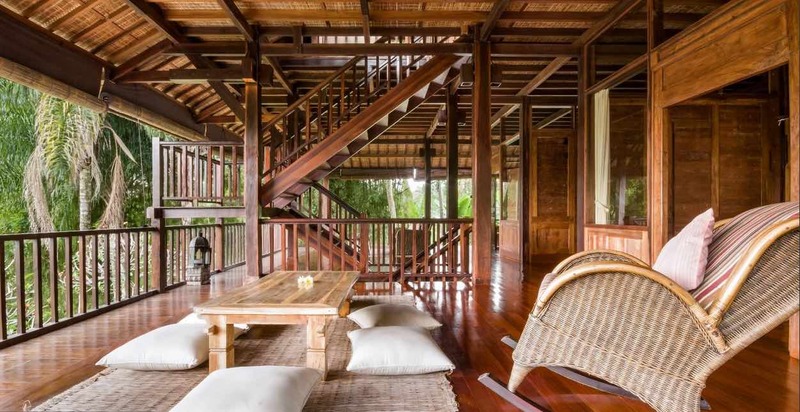 Large rattan sofas, antique tables, floor cushions and classic cane rocking chairs provide abundant space for friends and family to socialize ant take in the gorgeous views. 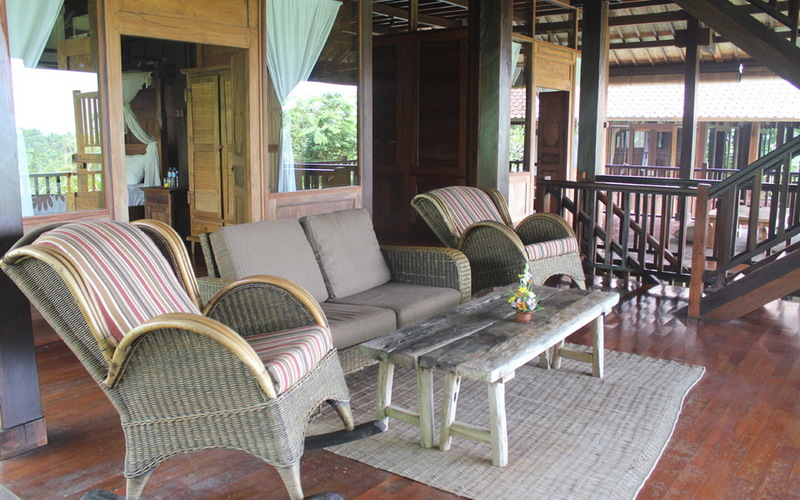 If you want to sit back and read a book in peace in quiet there are plenty of cozy spots to choose from. 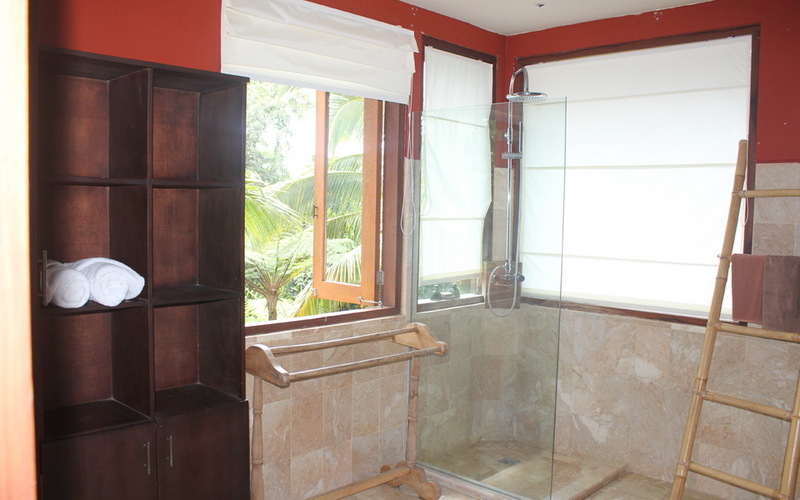 Both pavilions feature spacious open kitchens equipped with modern facilities and there are guest bathrooms with terrazzo floors, rain-showers, natural stone washbasins and toilets. 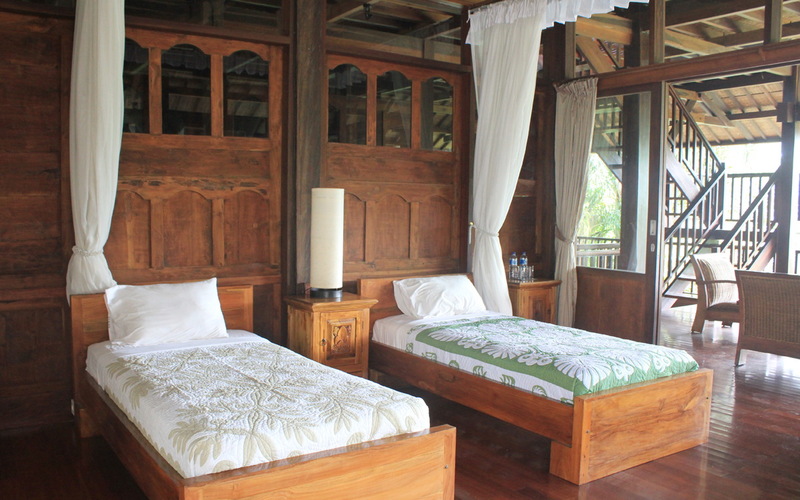 On the upper floors you will find the master suites boasting amazing views from a high vantage point, solid timbers are the main décor element, polished floor boards huge timber four-poster beds where less is more in these beautiful rooms with flat-screen televisions so you can watch a movie from the rattan seating area or the comfortable king-size beds. 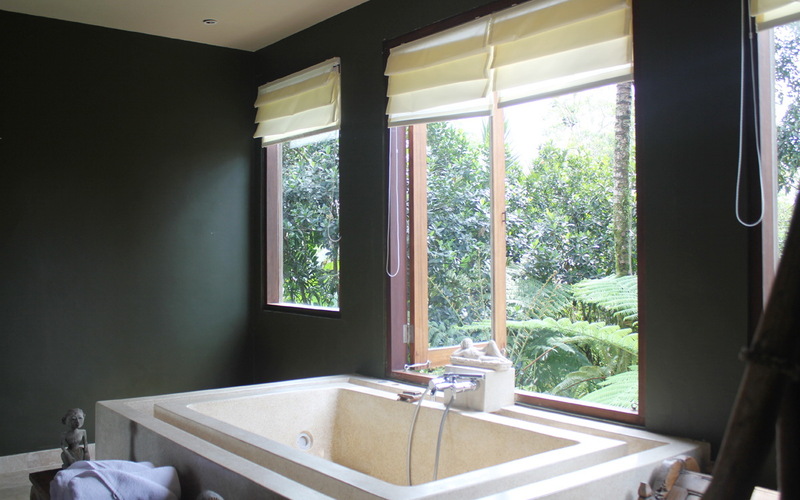 The en-suites feature terrazzo soaking tubs, elevated to enjoy amazing views and monsoon showers. The second level is where you will find the 5 guest suites, equally appealing as the masters, two boast twin beds while the remaining three rooms queen size beds. 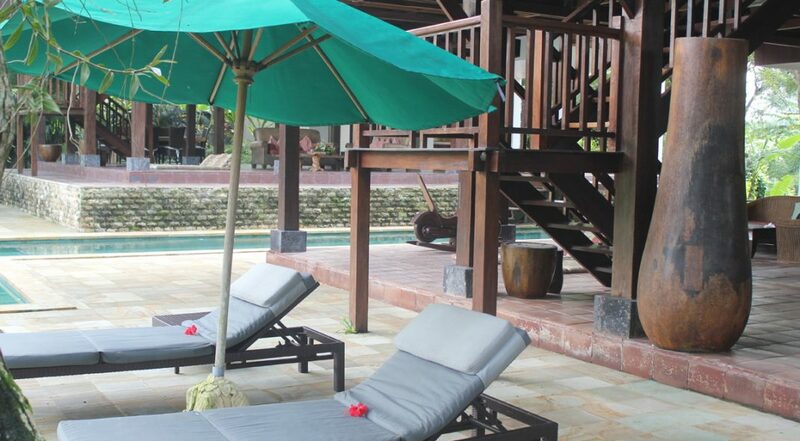 There are four fabulous Balinese staff at Villa Atas Awan all ready to pamper you and look after all your needs throughout your stay to make it as relaxing as possible. 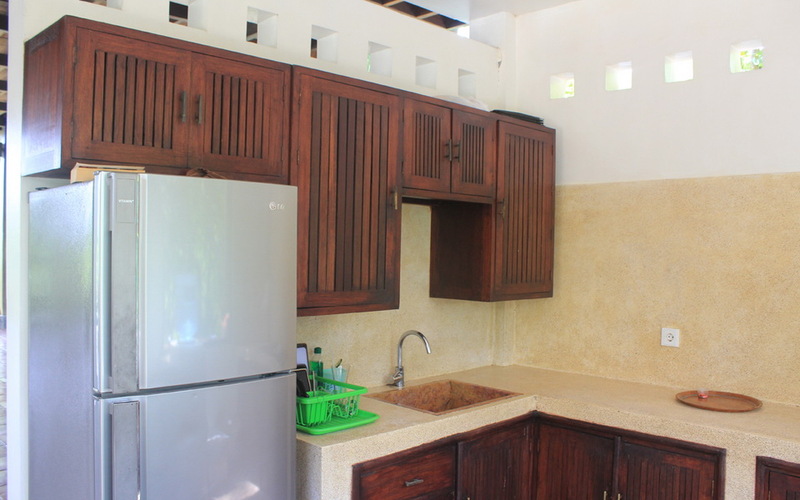 Daily housekeeping and 24 hour security staff are on hand and there is a shuttle bus to get you to the city centre and local activities such as cooking classes, yoga, cycling and trekking, rafting and much more. 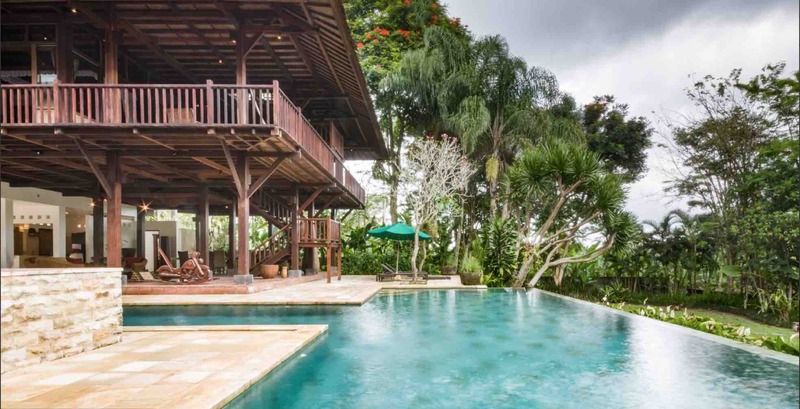 Villa Atas Awan is located on the outskirts of a peaceful Balinese village and a short journey will bring you to the centre of Ubud; guests can enjoy attractions such as Hanging Gardens, with its piano lounge bar or the river café. Ubud is a Mecca for art and culture where there are some beautiful art galleries. Some of the best places to eat include Kubu, Blanco, Locavore, Moksa, Who’s Who, Sweet Orange, Bridges and Batu Bara Grill to name a few. 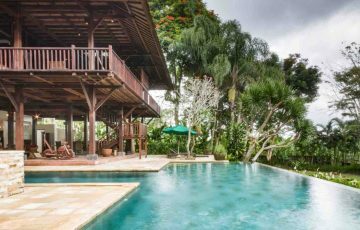 To view other Ubud villas near the centre of town or our full range of Bali villas please browse this website or contact our reservation team. 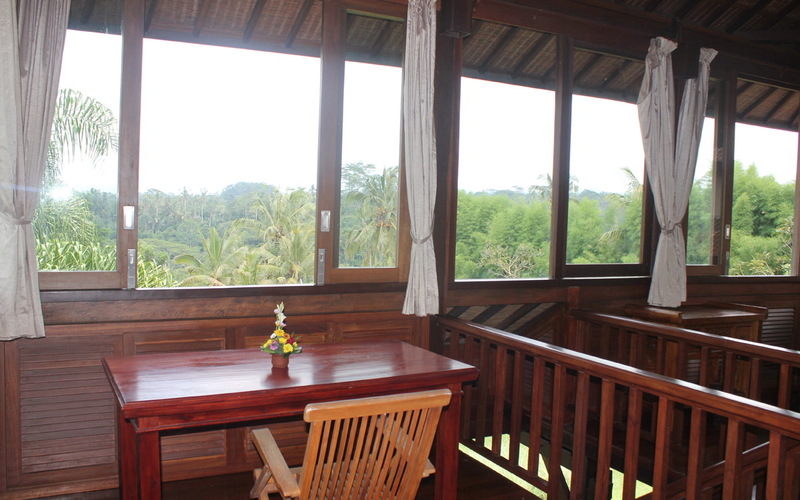 This is a popular Ubud holiday villa rental so if your planning a trip to Bali, especially during the Australian school or public holidays please book Villa Atas Awan well in advance. 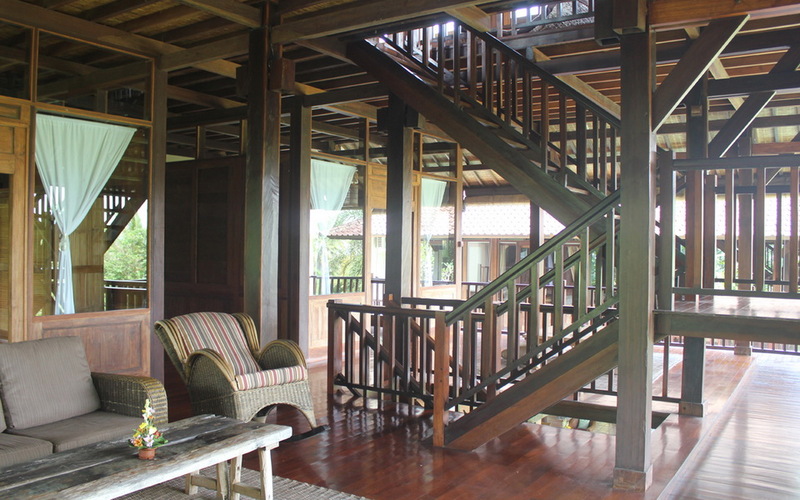 We enjoyed every minute at the lovely Villa Atas Awan and we are more than happy to say that we will definitely be coming back. We are all vegetarians and the chef was happy to prepare these meals for us which was awesome. 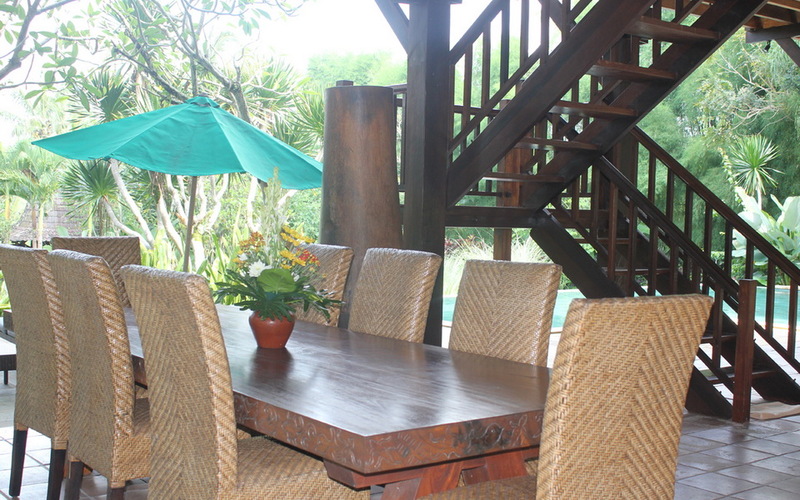 Such a warm and friendly ambiance with a really relaxed vibe. We feel so refreshed now. 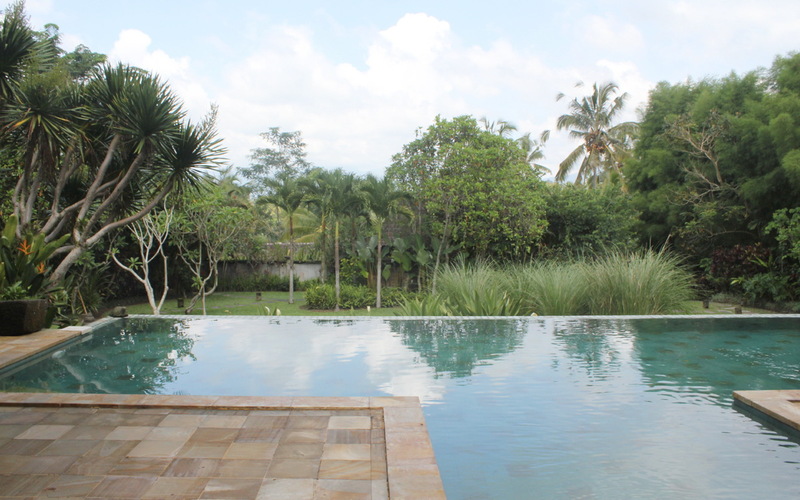 We we so lucky to be able to stay at the villa with 2 families and 8 children. There was surprisingly so much room for everyone and the kids had an absolutely fabulous time running around the garden and enjoying the pool. 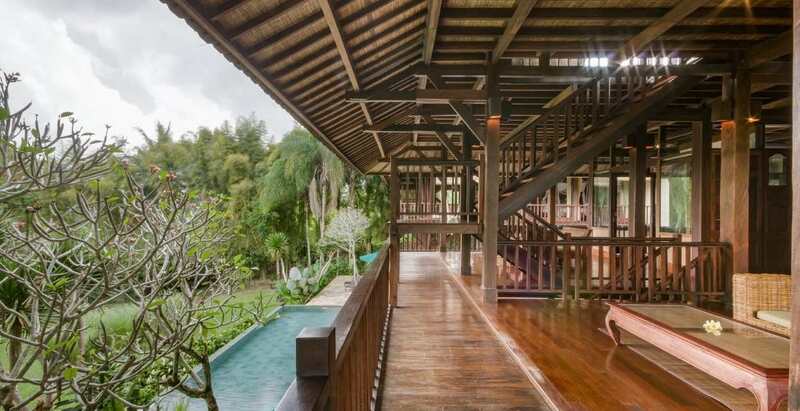 Villa Atas Awan is a gem of a place and what I would regard as a real Balinese holiday experience where you are completely surrounded by natural beauty and all you hear are the sounds of nature. 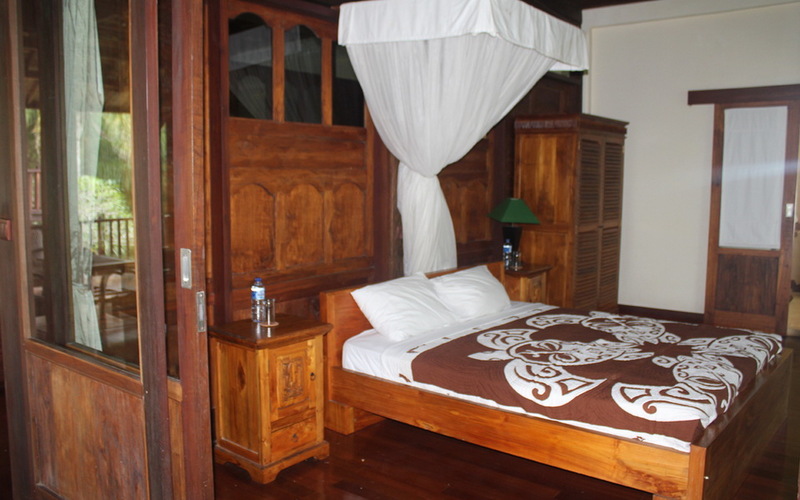 The rooms were all really clean and very spacious and once your in there you feel as though you have loads of privacy. 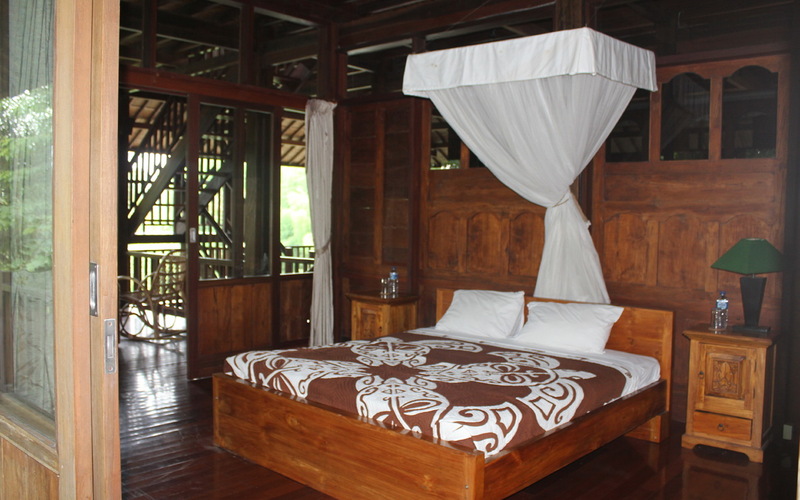 Staff there is amazing and the villa manager Abong and the rest of the team are so friendly and were really happy to organise tours to the rice fields on bikes and to see the monkey forest with the kids. We did celebrate my sons 8th birthday here and as soon as the staff found out they prepared a birthday cake...now that's real customer service. 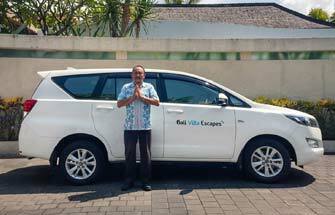 I want to thank Ina and Christine at Bali Villa Escapes for all their efforts in getting us this villa and for answering my emails so promptly. You guys are the best! 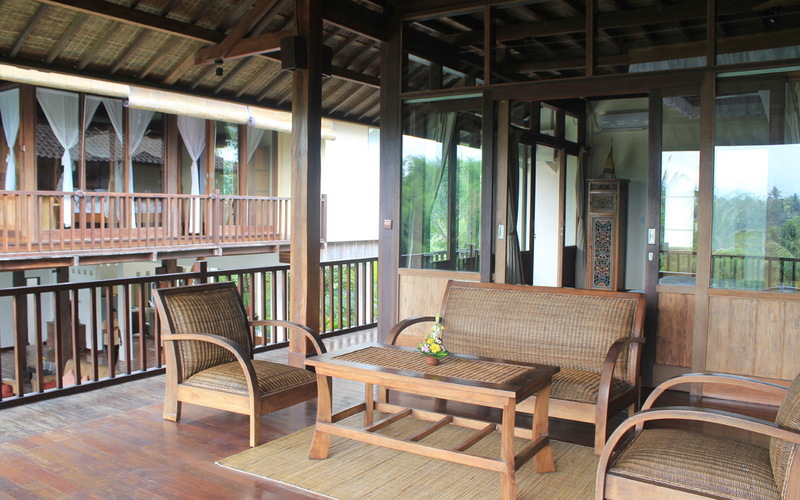 The actual setting of Atas Awan is awesome and waking up to those sensational views of the mountains and those picturesque rice fields were what we came here for. We really couldn't think of a more perfect way to begin the day. Plus we went by the pool for a morning stretch which was great before the staff served us our healthy breakfast. 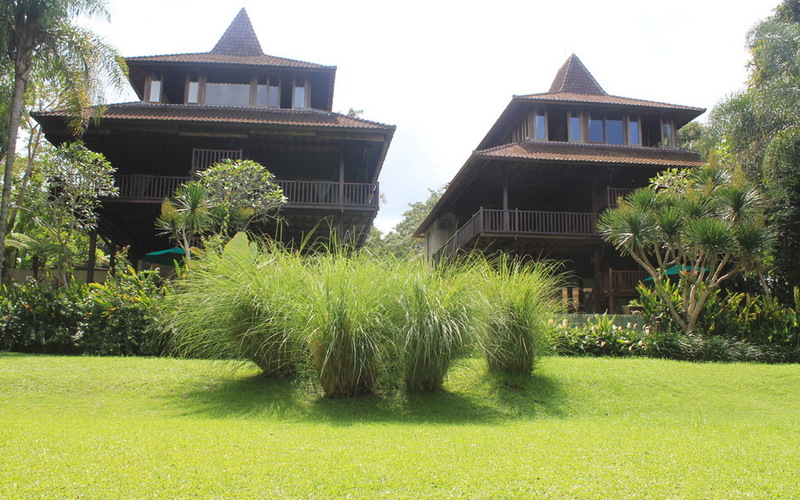 Villa Atas Awan's location was also exactly what we were looking for. 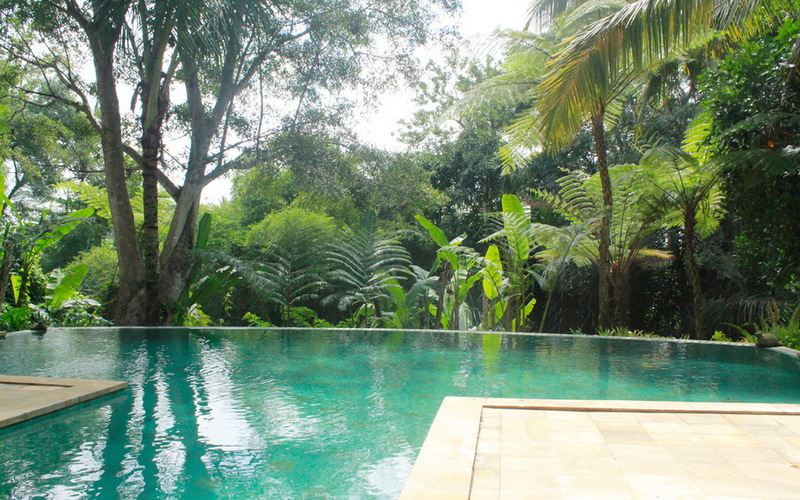 It was super easy to get into Ubud, roughly 20 min, where we shopped, dined out and had lunch as some wonderful cafes. The villas staff were the best and we loved seeing them every day when they came into the villa. The team of cooks and cleaners always had a smile and made up feel right at home. They made some Balinese feasts for all 10 of us for a couple of nights and this was their doing - we didn't even ask for it. What a real treat!! 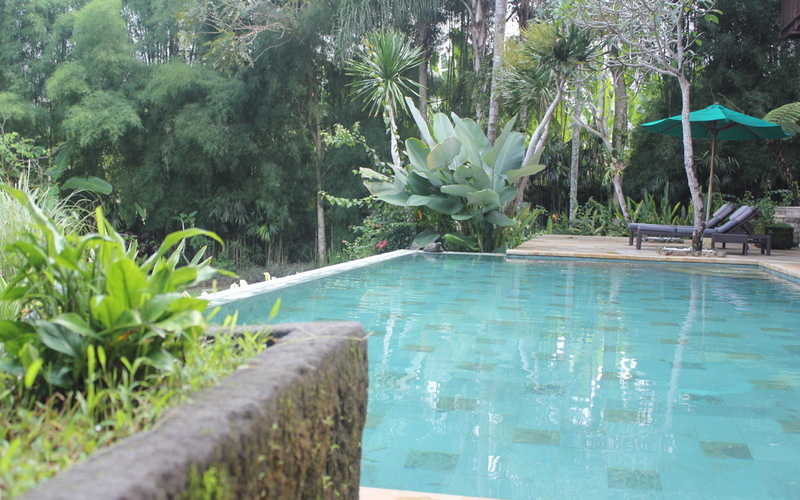 More than happy to recommend this to anyone seeking a once in a life time Bali holiday experience. 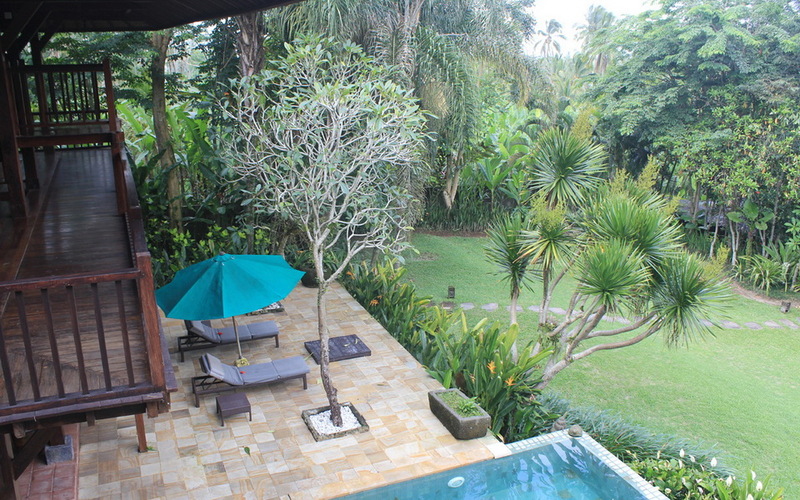 Spent 8 days here with a crowd of friends and can only say that this was a gorgeous villa. Peaceful and really relaxing. I think I have my zen back now!! 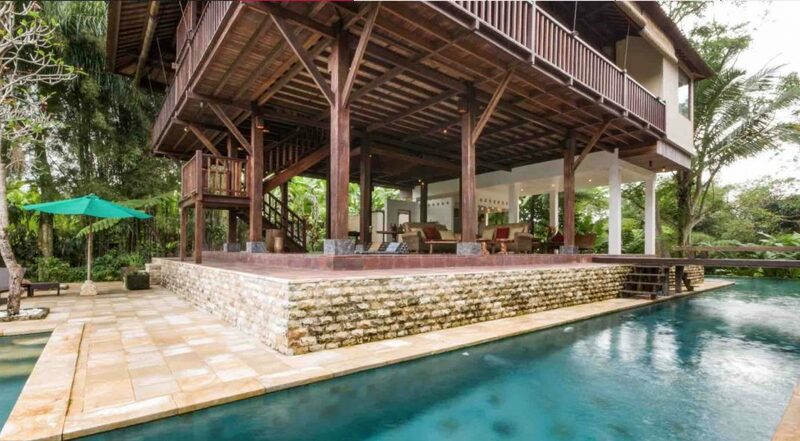 Try this villa out. You will not regret it. 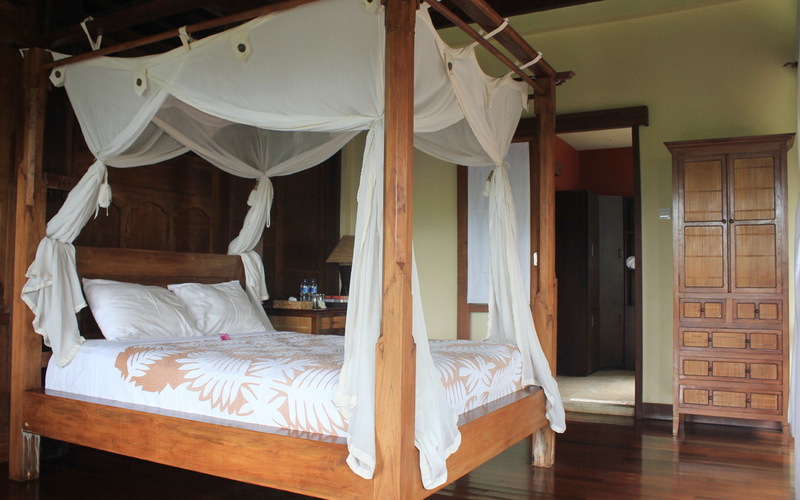 If you have never stayed in Ubud before or never tried villa holiday living give Atas Awan a try - it's so laid back and has an lovely ambiance. Staff, pool and bedrooms were all wonderful. Happy to recommend it. 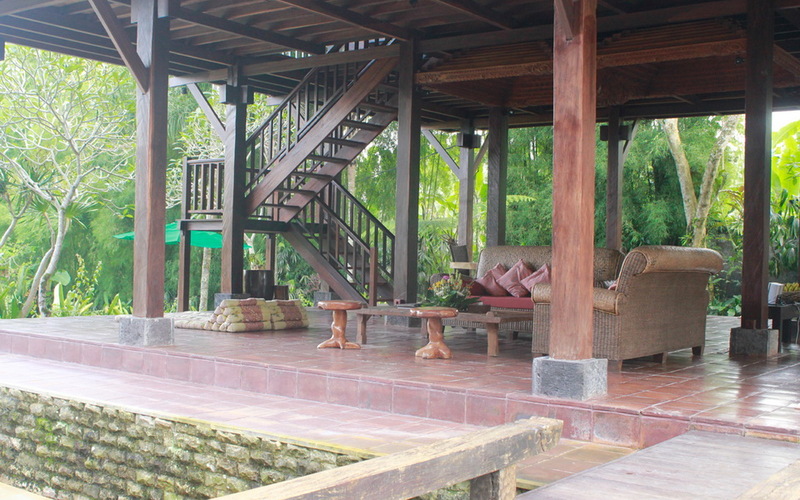 Our 5 day stay at Atas Awan was fabulous. The villa staff were all sensational. 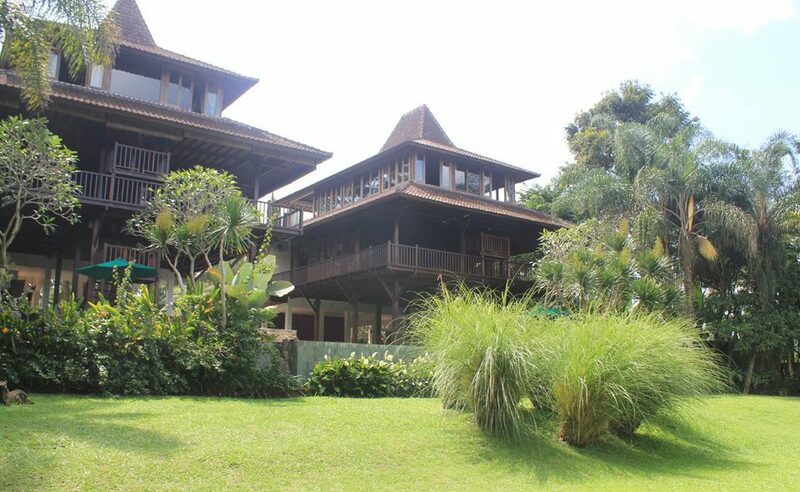 All of the 7 bedrooms were well appointed, large and just perfect fr our family. So happy we ended up staying here on the advice from a friend who had been here last year and couldn't stop raving about it. So happy we decided to stay here & we are definitely coming back.